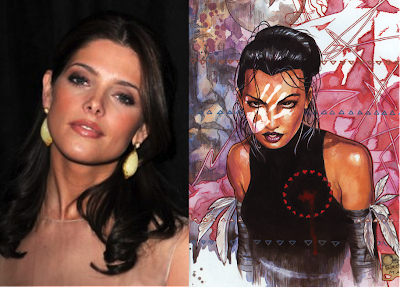 The chances of Maya Lopez, aka Echo aka Ronin, coming to the big screen anytime soon is probably less then nothing. 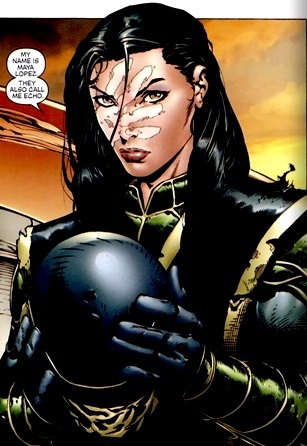 However, when Echo was interested into the Marvel Universe, she was probably on of the characters with the most potential to go on and capture the imagination of comic fans everywhere. Her introduction warranted Maya Lopez as a interesting, intriguing prospect, however for some reason Marvel couldn’t find away to keep the character interesting after her initial entry into the Universe, so they ended up killing her. While still a young girl, Maya Lopez's father (known as Willie "Crazy Horse" Lincoln), was killed by the Kingpin (Wilson Fisk). As Crazy Horse dies, he leaves a bloody handprint on Maya's face. His last dying wish is that his partner in crime, the Kingpin, raises Maya well: a wish the Kingpin honors, caring for her as his own. Believed to be mentally disabled, as it turns out she is actually deaf, Maya is sent to an expensive school for people with learning disabilities. There, she manages to completely replicate a song on the piano. One day, upon visiting her father's grave with Fisk, Maya asks how he died. Fisk tells her that Daredevil killed him. Maya is sent by the Kingpin to Matt Murdock to prove Matt's weakness. He tells her that Matt believes he is a bad person, and that she is the only way to prove him wrong. As Maya believes him, it would not appear to be a lie when she tells Matt. Matt Murdock and Maya soon fall in love. 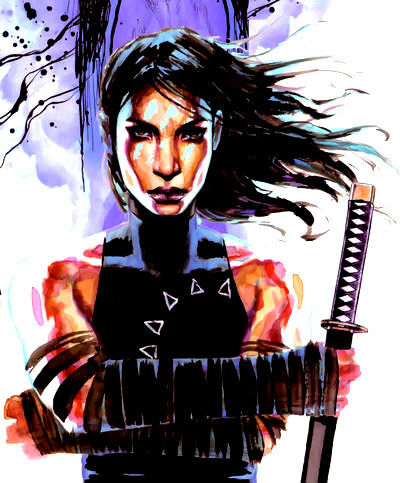 She later takes on the guise of Echo to hunt down Daredevil. On her face she paints a white handprint, similar to the bloody handprint left by her dying father. Having watched videos of Bullseye and Daredevil fighting, she proves more than a match for Daredevil. Maya easily figures out Daredevil's weakness, and exploits this by having him fight in a place where his heightened senses are useless. Maya easily takes him down and nearly kills him, refusing only when she finds out Matt and Daredevil are one and the same. Matt manages to correct the Kingpin's lies. In revenge, Maya confronts Fisk and shoots him in the face, blinding him and starting the chain of events that lead to his eventual downfall (Kingpin would later partially recover his eyesight through reconstructive eye surgery). After realizing the horror of her actions and the lies she has grown up with, Maya flees the United States to do some soul-searching. When she comes back Maya visits the Kingpin in prison, who tells her that he doesn't blame her for what she did, and that despite all that had happened, he still loves her like a daughter. 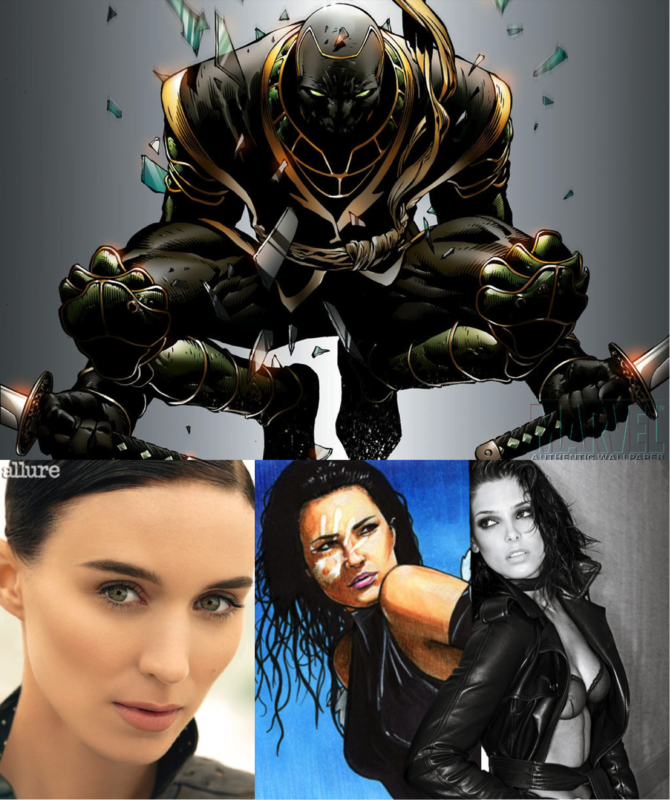 She then ends up taking a soul searching journey when she meets and befriends Wolverine who helps her recover and passes on his knowledge of Japanese culture and Japanese organized crime. Soon enough, Echo makes peace with her past and is back doing performance art. 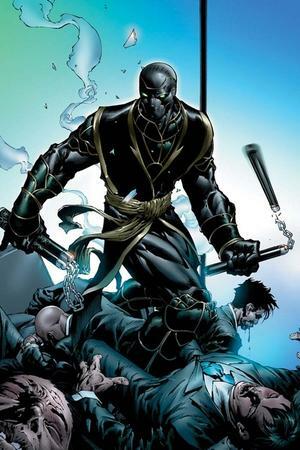 If that's not interesting enough, Maya would later go on to don a suit that conceals her identity as well as her gender and rechristens herself Ronin. As Ronin she takes on the Hand and organized crime in Japan while, she acts like a party girl, to get close to some of the crime heads at the local night clubs. Maya certainly is a cool interesting character; a film about her will really be different from anything Marvel is doing now. A film set between Japan and the USA, where the villain actually shows remorse for his action, where the female protagonist disguises her self as a male vigilante, not to mention that this conflicted woman is deaf. This film can really be a character driven film, like Drive and the Girl with the Dragon Tattoo. With a visionary director, a brilliant script, and a good solid lead, Echo can be a film unlike any other superhero to date. Maya Lopez is an Olympic-level athlete possessing "photographic reflexes" or the uncanny ability to perfectly copy other people's movements. Just by watching other people, she has become a concert-level pianist, a strong martial artist, and a highly skilled acrobat. Basically in a hand-to-hand fight, Maya is one tough lady, as she can mirror her opponents’ movements. In addition, she has also gained Bullseye's uncanny aim and Daredevil's acrobatic abilities after watching tapes of their fights. Ashley Greene is a beautiful talented actress, crating out her career. Most Twilight fans will know her as Alice Cullen, but don't let the whole Twilight thing deter to you from a true rising star. She has been in a few other films, aside from Twilight but they really aren't anything to go on. Greene’s next film on the other hand, Apparition, looks to be the one film that really shows Greene’s worth and really test her acting prowess. We think this young actress still has more to offer, and we think a role like Maya will definitely be the role that could propel this star in superstar status. 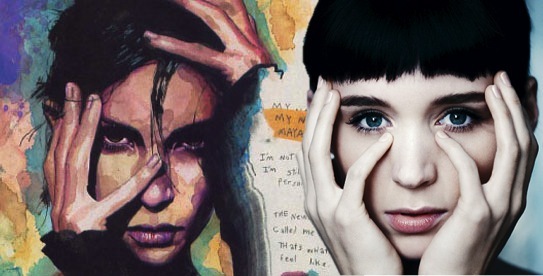 Our number one choice for the role is Rooney Mara. Do we really have to even say why?! The star of the Girl with the Dragon Tattoo exudes a powerful on screen presence, charismatic execution in her performance, while offering a hint of sensitivity. She can offer the hard outer exterior that Echo gives off, while, allowing the audience to see her fragility and connect with her. Rooney Mara’s performance as Lisbeth Salander is probably the one indication of what a character like Maya Lopez should be. Not so much as strange, but a bold, strong, highly motivated woman, who will do just about anything to hit her mark. As Maya is deaf this will allow the story to be told, by watching her body language, facial expressions, telling some of the story through sign language, yes Maya can talk, but the audience will be more involved in the story if we don’t hear her speak that much. The Rise of the Planet of the apes is a perfect example of this. Rooney can bring will be able to get into the characters mind as few others will really be able to. Maya Lopez was a real interesting character, with someone at the helm like Nicolas Winding Refn we guarantee that Echo, will be given the proper treatment she deserves. I have to agree with Alexandria because Latinos and native Americans barely get screen time, in the few roles that they have in Hollywood that's not stereotypical. "The chances of Maya Lopez, (alias as Echo aka Ronin); coming to the big screen anytime soon is probably less then nothing. However, when Echo was interested into the Marvel Universe, she was probably on(you should have 1 here) of the characters with the most potential to go on and capture the imagination of comic fans everywhere." I loved the topic you chose to elaborate on. 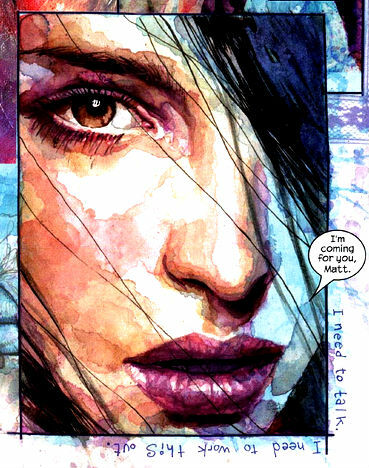 Maya Lopez has status as a cult classic character as one of Bendis's greatest comic fronting heroines. Definitely the most interesting column I've read about a fictional Heroine. Good Effort.